I still can’t decide. Sometimes I think it’s just crazy crazy, but lately I’m leaning more towards crazy fun. After realizing that my scrap situation was getting a little out of hand, I needed to make something that would use them up. I wanted to try to make a block where all the points met in the middle, somewhat reminiscent of a spiderweb block, but without the paper piecing (and without the eight-sided web part). I pieced these in an improv-style, grabbing scraps as I went, and not worrying about the sizes of each wedge. I pieced each half individually, then matched them with another half to make each square block. I made a few blocks to test it out, and I didn’t think they were too bad, but I wasn’t getting a very good reaction from Morgan. Each time I’d make another, he’d wonder aloud why I was making more of them. It got to the point where he’d just shake his head when he saw me reach for the scrap basket. I thought he’d see my vision when it was all sewn together, but to be honest, I’m still not sure he’s feeling it. You know what though? The more I look at it, the more I like it, and that’s all that matters right?! But with that said, what’s your opinion? Crazy crazy? Or crazy fun? Update: I’ve just posted a tutorial showing my process for creating these blocks. You can find it here! This entry was posted in Posts about Quilts and tagged fabric scraps, flea market fancy, handmade, hope valley, quilt, quilting, scrap quilt, starburst. Bookmark the permalink. 151 Responses to crazy crazy, or crazy fun? Crazy fun for sure! Keep them coming … I need as many scrap ideas as I can get! I like it! The fact that all the pieces come to a point in the middle of each block brings a certain cohesiveness to it. This unifying theme definitely keeps it fun! It’s a very clever use of scraps. Will you add a border? I imagine one of your Kona solids would do a nice job framing it (and maybe make it less crazy for Morgan). Definitely crazy fun! I LOVE it – think you might have inspired me to try some crazy fun too! That’s sure come crazy fun!! I was downright startled when your blog came up on reader because just yesterday I was contemplating the very same idea. Now that I see your results, I have a little more confidence to go ahead and try it. Mine will have to wait though until I finish a few of other projects. Nothing I don’t love about this; crazy good fun! i like the crazy. feels a bit vintage throwback. Definitely crazy fun. That’s so adorable! I think it’s Crazy Love! Gorgeous and creative! So nice and bright and cheerful I can’t help but smile, so: crazy fun! This is a great way to use your scraps. And I love how colorful it is. It would make a good play mat for a baby. Jenn – I was thinking the same thing! It does look like a great play mat. That, or maybe even a fun wall hanging! I really like it. Even though it’s busy your eyes can rest on those muted blues and greys. Nice one. Crazy fun for sure! I’ve been lurking at your blog for quite some time now, but I had to speak up and say that I love this one! You have such a great eye for color and this is no exception! This is wonderful!!! I prefer the ‘busy’ness of all the fabrics and I love the ‘crazy’ness of the the pattern. What a ‘happy’ ending to a test. Well done!!!! Yep, I’m on the crazy fun side. I love the way any given scraps come together to make their very own palette. Totally crazy fun. LOVE IT. CRAZY FUN! I love this. I love it too, it’s fun, bright & energetic! It’s great! I think what makes it not over-the-top is the fact that you used some really muted colors -especially the grays and greens – along with super bright prints. It’s a perfect picnic blanket pattern! I like it a lot but I wonder what each block might look like sashed in a color? But it’s cool how it is too. I’m leaning towards crazy fun! I really like it. Gwen Marston has some quilts made like this in her Liberated Quiltmaking II book, but those were done with solids. I like it much better in prints, the way you did it. I wonder how this would look with my scraps. Will have to try it out. Thanks for showing. Crazy fantastic! 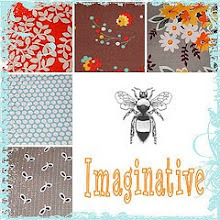 You always use such gorgeous fabrics, the scraps were going to look brilliant no matter what, how could you go wrong!? Genius! Once you corral all that crazy fun with a border, it will be perfect! a little crazy but what fun! love it! I love it! I definitely think it is crazy fun!! I love scrappy quilts. They bring back memories, right? Little bits of lots of your favorite fabrics all in one place! I really like the whole pinwheel look of it!!! Not so sure my scrap pile would produce such a lively, brilliant overall look but your’s is beautiful! Absolutely love, love, love it!!! when i do crazy stuff, my family doubts me sometimes, but they always change their mind with the finished project Yours is definitely crazy FUN! 🙂 (on your next square you’ll have to take a few pictures to show us all how you are achieving this look with the center point, I’d love to give it a try) Thanks for the inspiration!! Love it! It is definitely Crazy Fun!! after all these comments, do you still have any doubt it’s crazy in a good way? I love it! Absolutely gorgeous. Give us more details about how you did it, ok? I want to know how you got the center point. I love it! Your creativity absolutely amazes me. 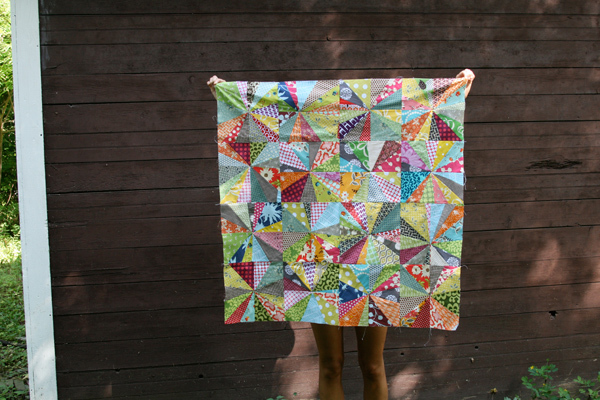 For sure, you are the most inspiring quilter out there…(on the blogoshpere ;)! Definitely crazy fun! We want more Ashley! I love it and I would love a tutorial on how to make the blocks. I love it, this is my kind of quilt! 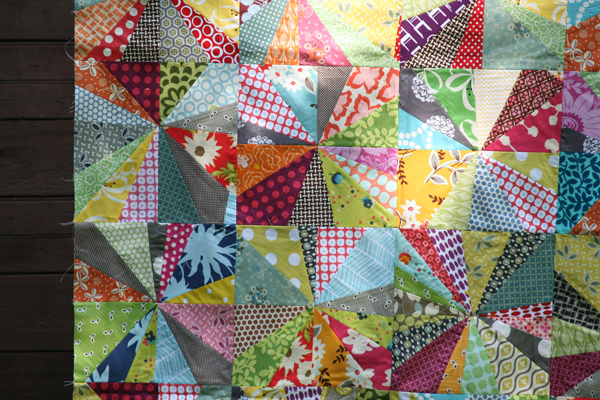 I made something similiar with a pinwheel block using scraps of fabric from all the clothes I made as a teenager. Crazy Fun right now, but quilted it’ll be Crazy Beautiful. I like it without the sashing, but I think it needs a black & white striped binding. crazy fun for sure! 100% cute. i love crazy improvised quilts. go with it girl! F-U-N… Fun! I dig it! And, I LOVE the colors! Definitely crazy fun and great! Dude, that is crazy fun! It made me think of the quilts my grandmother made in the ’30’s. I still look at them and think, “How did she ever put those colors together–and how do they work?” Across all the decades, she’s nudging me to be a less rigid quilter–and you’re inspiring me to do the same. That is so crazy fun!!! I love it! The cutest quilt I’ve seen in a while. Like everyone else CRAZY FUN!! I love all the colors and patterns mixed together makes it a little scrappy just like my granmother made. I always love your quilts! I LOVE it. In that I want to steal it and cuddle with it all the time kind of way. It’s perfect. Besides, what do boys know about quilting? My husband always loves the quilts I hate and isn’t crazy about the quilts I love. We’re doomed to disagree when it comes to quilting. I think it is adorable! Would be so cute for a baby! Most definitely, both happy and fun! wow can’t believe you were doubting yourself! it’s nice to see something totally different from you…and it turned out amazing, you should work like this more often! Definitely crazy fun! Not all quilts are supposed to be formal precision. Not only is this quilt fun to look at, you’ll be able to enjoy the memory of all the fun you had when you made it. Crazy fun, have to dig into my scrap (laundry) bag and make one for myself. Crazy fun for sure! I saw the photo before reading your posting and reacted with, “How gorgeous!” Then I read the posting and was surprised that the quilt top’s beauty could ever be in question. Crazy fun! Generally, I’m not a huge fan of scrappy quilts. But I totally love this one! It definately gets my vote as Crazy FUN! I think I will make one myself. 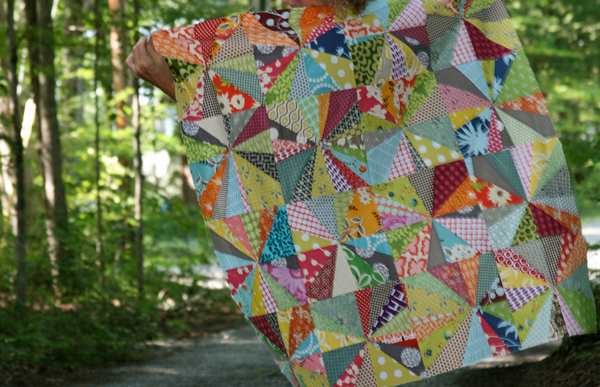 most definitely, this quilt top is crazy fun! Crazy Fun, absolutely. Love the “pinwheel” look of the blocks! Love it that you push the limits with colors and fabrics! Crazy fun!! I love it – anyway we can get a more detailed tutorial of the blocks? I think its both depending on how I look at it & I love that about it. I think I’m going to try to make one similar, but i’m thinking perhaps doing 1/4 or 1/2 of the square wonky wedges and the other a solid or less graphic print. Yeay thanks for the inspiration I think I’ll start it this weekend. I think it’s so cute!! I think it’s crazy good!! I really like it! IS a tutorial coming soon?? I like crazy fun! Perfect. I love it. So crazy fun it is. I like the wonky spider webs MUCH better than the exactly measured ones. Great idea! Definitely crazy fun…I love it! 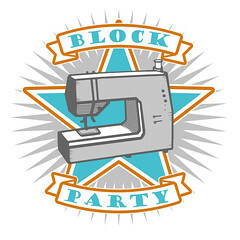 Might be cool with sashing around each block too for a little less crazy? Maybe using one of the Kona grays? This is definitely crazy fun, and I love it! I love how you used the spiderweb block for inspiration, but used just scraps instead of using a solid fabric for foundation center. Such a great way to use up scraps! I want this please say you’ll sell it!!!!! Or teach me how. I have a baby on the way!!! Another vote for crazy fun! Crazy yes, but so beautiful. I love how modern it looks too. Crazy talented!!!! Will you post a tutorial???? Please????? Crazy fun! It’s fabulous, Ashley! Crazy fun, of course! Are you going to keep adding to it? I really like how this turned out!! Great use of scraps. If that is crazy – lets all be crazy forever. Crazy fab! I needed an inspiration after days of blistering 100-degree heat and this is it! Thanks! I think it looks great–I love the different use of scraps. My scrap pile is really getting out of hand also and I’m constantly looking for ideas to use them up when I get to them. I think your idea has turned out beautifully. My husband does the exact same thing to me when I’m working on something he deems “busy” but in the end I think he doesn’t really need to be in love with all my quilts! What would Gwen say? Fabulous I reckon! It’s lovely. Crazy FUN !!!! Loving it ! i am loving all of it’s crazy fun! Love, love, love this. Can’t wait to try it myself. You are an inspiration! Love love it! Keeps the eyes going around and around. You Go GIRL!!!!! LOOKS FANTASTIC!!!!!!!! Now do the same crazy with the border. Oh, I love it. Definitely fun. Crazy fun AND crazy crazy!!! Crazy Love!!! I love it! We need a tutorial of some sort for this beauty. It says crazy fun all over it! Thanks for sharing! crazy awesome! i love it! I like it a lot — reminds me of the kaleidescope and “kite” quilts that are popping up around flickr. I found an *old* (late ’80s, cough) pattern from BHG with templates for piecing a similar quilt, but I much prefer your liberated style! CRazy fun indeed! Tutorial please! Oh and in your spare time (teehee) if you could do a post on how you get your charm squares to always line up so perfectly in your quilts I would *greatly* appreciate it! It is such an amazing quilt. Crazy fun, all the way. What’s not to love? Crazy, fabulous fun is my verdict! Great quilt Ashley! Although I love Gwen’s quilt what I like about yours is that you don’t get the secondary design and that allows the eye to travel all over the quilt rather than being continually drawn back to the star. Such a lively quilt top! Did you spin the seam allowances to reduce the bulk in the center? Directional pressing makes all the difference! And such a treat to view your work! Crazy Fun for sure!! It’s just fantastic! Very fun! I can think of several uses for your scraps – maybe a giveaway is in the offing? Crazy fun! I think it would look good with sashing around each block as well. I really enjoy your blog!